Like the disintegration of the formerly charmed stock market, the return of Carmageddon is right on schedule. I had stated early last year that one of the first cracks in our economy to become evident would be the crash of the car industry. And now here we are. Even though the auto industry got temporarily bailed out in 2017 by the collision of natural forces like hurricanes and wildfires, 2017 still ended as the first year of declining US auto sales since the Great Recession. My timeline for the fall of stocks and the resumption economic wreckage in the auto market was the start of this year. Now that first-quarter results are in, they show that is exactly what happened. While Ford Motor Company reported frontline news last week that earnings were up in the first quarter, that was entirely due to the tax savings it realized under the Trump Tax Plan. Earnings before interest and taxes were sharply down. In other words, Ford was saved from their poor performance by the new tax law, not by any expansion of its business. Wow! That’s huge … all in one sugar-coated bite. With as little commentary as possible, one of the big-three automakers has just announced it is practically going out of the car business! (While staying in the truck business.) It will no longer be developing new lines or cars or new generations of old lines, except for Mustangs and the Focus hybrid. Ford is essentially giving up on cars and going for the gold in the only area where it has remained profitable — trucks and SUVs — which it will begin converting to hybrid powertrains. (So, there is, at least some research and development that will continue within the final bastion of its profitability.) Thus, Ford will save $5 billion dollars through “efficiency” (cut $5 billion in capital spending) by ditching almost all development in new car production where its sales are dying and moving money spent in those departments to others. That is the new Ford focus. That is Ford efficiency. And that’s how you parse a corporate report to take all the artificial gloss off of it. The death of Ford car production this year is practically just a footnote in the corporate report as Ford moves on to developing autonomous delivery vehicles and autonomous taxi services with its SUVs, vans and trucks. That’s the Ford of the future. That may be good positioning with a future focus, but it is also Ford’s admission that its car sales are dead! The hundred-year manufacturer of touring cars and sedans is giving up on that market that it pioneered and doing so with as little eulogy as possible, while the profitability of its move toward autonomous vehicles and taxi services remains to be seen. Like I said last year. While the company would love to blame tariffs for what will happen in 2018, those possible horizon issues do not explain the major failures of 2017 or of 2018 to present. They just make a convenient excuse for a decline that clearly was well underway last year, got a temporary reprieve and has been deepening throughout the first quarter of this year, well before Trump said a word about steel tariffs. That’s why it’s called “Carmageddon.” Last year and this were the year auto sales died, and now we see the end result of what has been developing during the time frame in which I said the auto industry would experience major die-back. It’s worth noting that General Motors Company … didn’t specifically blame commodity prices in its 2018 outlook. That suggests … perhaps that [Ford’s] management is looking to shift some blame from its own operational decisions. General Motors Corporation’s report last week for the first quarter of 2018 was more on the nose. GM simply reported a major hit to profits in the first quarter of 2018 and is countering Ford’s shift to light trucks by gearing up in that area to battle Ford more intensely. So, two of the big heavies are going all out on bumper-to-bumper truck combat. Yeah. Sure. Net income down by almost two-thirds sounds like right on plan to me. Must be a hell of a horrible plan! The coup de grâce? Even with its truly massive stock buybacks, earnings per share were also down by a whopping 18% year on year. As a result of this dismal performance, GM stocks have dropped to a one-year low. Carmageddon. The beginning of the end of global imperial status. The big three auto manufacturers have devolved to essentially creating cars as something to loan against and then making all their money off of interest on the loans and leases; but when you make high-risk loans to boost car sales, you pay for that a year or two later. That time has come and will get much worse as interest rates are now being forced upward by the combination of rising Fed targets and the Fed’s Great Unwind from bonds. The third member of the Big Three auto makers in the US — Fiat Chrysler Automobiles (now as much a European company as a US company) — on the other hand, did well. Well, sort of. FCA reported record first-quarter earnings that were up as much as GM was down — 59%. Of course, the company said its earnings were largely helped by lowered taxes. Earnings before taxes and interest saw only a 10-point jump compared to a year ago, though that is still not bad. Of course, the company approved a buyback of 10% of its shares in 2015, and its CEO now says that share buybacks and dividends will become “endemic” to its future business structure. In other words, buybacks have become essential to the survival of its stocks. As they have in most corporations now as a way of boosting price-earnings ratios to create the appearance that earnings have improved and drive up stock prices by creating demand internally for their own stocks while diminishing supply of their own stocks. That’s the new paradigm of business that has replaced making money the hard way through R&D and capital improvements and employee training, etc. (that slow, boring stuff). General Motors Co., Ford Motor Co. and Fiat Chrysler Automobiles NV all posted U.S. sales that fell short of analysts’ estimates for last month [January], as demand plunged for domestic sedans including the Chevrolet Cruze and Ford Fusion. Toyota Motor Corp. and Nissan Motor Co., meanwhile, boosted deliveries thanks to RAV4 and Rogue crossover models. A strong finish in 2017 due in part to heavy discounting, but due even more to hurricanes and wildfires destroying hundreds of thousands of cars that had to be quickly replaced at the end of 2017. Temporarily saved by disaster that shifted the automakers burden to insurance companies. Not that Chrysler, too, is moving away from cars and into SUVs, vans and trucks, which is another way of saying the European automakers and Asian automakers now completely own that market. FCA also cut its debt by $1.3 billion. While profit was up due to earlier cost-cutting measures (elimination of all of its marginally profitable lines), first-quarter revenue was actually down by 2%. So, the story for the Big Three is mixed but generally not good for Ford and GM as the long-term underdog is starting to overtake them. though its revenue was in decline, too. The telling truth is in auto sales, more than in stock-related actions. Sales for Fiat Chrysler declined for 17 consecutive months , in spite of what automakers called a good finish for 2017. For example, pressed to discontinue its heavy discounting to rental-car companies, FCA’s January sales to rental-car companies were down by half year on year. My prediction was that the temporary boost to auto sales from hurricanes that were biblical in scale would wane by the end of 2017, and we’d be back into Carmageddon by the start of this year. 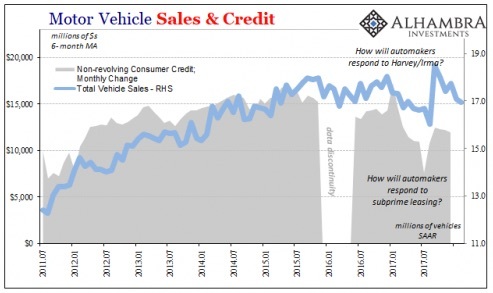 The predicted boost to sales in autos as well as other things as a consequence of storm-destroyed automobiles does not appear to have unleashed an economy-wide shift (the long sought “S” curve of Paul Krugman fame). It was quite often talked about in that way, of course…. Of course it didn’t change the trend that is Carmageddon at all. Anyone should have been able to realize the cars lost in hurricanes and wildfires would be replaced under insurance within a couple of months, and then things would revert to the true trend in sales. That was actually the largest December-January drop since … well, 2010, and the broader economy is no longer strong. So, the trailing hope of strengthening economy under the auto industry is gone. By that, I mean the halcyon days of the “harmonious global recovery” that was talk of the town back then now are ended. Europe is sinking, and the US stock market is miring down deeper and deeper. There is not much left of that harmonious daydream. The Great One’s tax plan is not even delivering auto purchases as people get their tax refunds and their one-time bonuses and even as they realize they are taking home a slightly bigger paycheck. 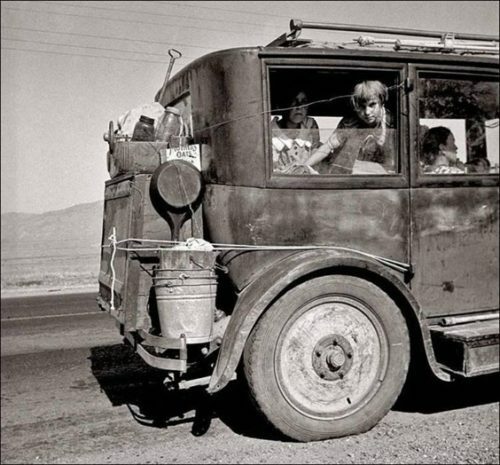 It was all no help at all to the moribund auto industry … or to the stock market and, as we shall see in my next article, to the housing market. Even light truck sales, where the US industry is now focusing, are down slightly from the last peak they hit after the hurricanes, while car sales are down by almost a third from where they were in at their peak, which was in 2014. It is, in fact, the same kind of subprime collapse beginning that we saw in the auto industry during the official Great Recession because … we have learned nothing. So, how deep of a rut are car sales in? Once again, we have to go back to the pit of the Great Recession to find the right term: Thirty-two percent of all trade-ins are underwater. This time we’re not talking about hurricane-caused flooding. That is to say that the buyer of a new car still has to pay off his old car loan out of pocket when he trades the car in. More often, the balance of the old loan gets folded into the balance of the new loan, making each generation of loans worse. That’s part of the reason for growing negative equity, but another part is that, in order to make new cars affordable (as expensive as they have become), auto finance had to be run out to seven-year terms (sometimes even eight now). That means the car depreciates in the first few years faster than the loan gets paid down. Banks, in other words, have been making riskier and riskier loans because … we learned nothing. This is called Carmageddon because, when the economy turns south, the losses lenders take on these automobiles will be compounded by the number of times negative balances have been folded into new loans. It is a death spiral. Negative equity in auto loans has been a worsening problem every year since … 2009. There’s that period again. Back then, when the auto industry last crashed, only twenty percent of cars were underwater on their loans. Thirty-two percent today is, in fact, the largest number of cars to have negative equity in the history of the automobile. And we’re not talking a little bit of negative equity. The average negative equity for those trade-ins that are underwater is $5,130, which is a thousand dollars more than the average back in 2009! So more cars in negative equity by far than during the Great Recession and a thousand dollars more negativity on each car. While auto loans are nowhere near as big a bubble as we have in housing, they are still big enough to become a significant domino when things start to fall or even to be a trigger by doing enough damage to weaken our economic structure to where the next event brings it down … and there are a number of events already lined up. Don’t listen to those who say otherwise; just use your memory to recall how significant this problem was as part of the Great Recession that needed government bailouts. Of course, there is, once again, that nagging problem of subprime auto loans being bundled into derivatives made up of better loans in order to try to offload the rotting meat by surrounding it with plenty of fresh meat. Sound familiar? Why? Because we learned nothing. Then there is that whole unemployment thing that begins all over again when Cartown starts to shut down because the auto factories are stalling and all the satellite businesses that depend on that core industry start to falter. This isn’t all going to play out this year, of course, but it’s back! And it’s not going away, unless for another temporary whirlwind reprieve.